The Emergency Response Common Operating Platform (COP) provides real-time access to critical information, through custom web-accessible alert and analytical tools, reducing emergency response time and improving coordination efforts. The COP integrates mobile and desktop users and provides data interoperability through utilization of the latest geospatial technologies from ESRI, including ArcGIS API for Flex, ArcGIS Mobile, ArcGIS for iOS, and ArcServer. The system enables statewide access to information sharing and coordination between senior leadership, National Guard forces, emergency first responders, law enforcement agencies and the general public. The capability utilizes role-based authentication to create a custom user interface based on the individual’s role, granting appropriate data access rights and providing a logging capability for data integrity. MATRIC’s modular COP design offers customers the flexibility to integrate as many tools into their existing infrastructure as desired. We offer professional services to ensure successful integration with your existing environment. For customers that are seeking a complete solution, we offer an “out of the box” COP system that can be tailored for your specific needs. Ticker Feed: Immediately relay crucial information to specific users or broad agency. 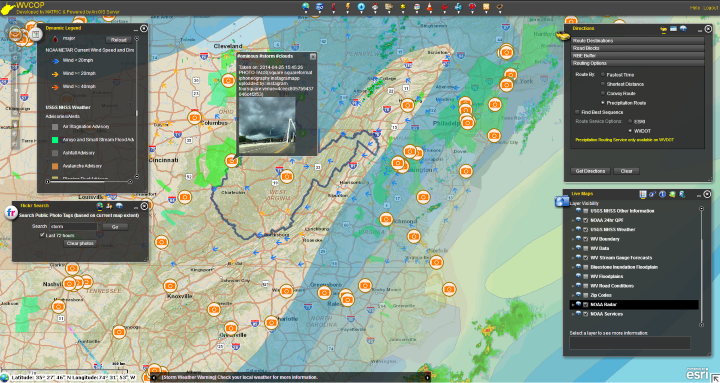 Critical Infrastructure Status Reporting: Provides critical information to emergency responders about operations throughout their region/state. Each county has certain attributes that can be set to various levels depending on their operational status.Provides up to the minute information about important events going on around the region/state. The Situation Report widget reports events such as, but not limited to, motor vehicle accidents, bridges out, chemical spills, choke points, emergencies, fires, and floods. Events can also be created out in the field using our new mobile applications. Automatic alerts based on live feed conditions: Set requirements for the system to automatically alert you when a specific condition has occurred (e.g., stream gauges reach above normal status). Rolling COP: The Rolling COP lets you create a slideshow of data to cycle through at different intervals. You can choose to include multiple data layers on each slide. Data archiving: Take periodic snapshots of live data feeds (weather, stream gauges) for playback and overlay for after action reporting. MATRIC AST combines creativity and innovative problem solving skills with a deep understanding of software application development to deliver market driven innovation.